documentaries and multimedia educational programming. Young Hemingway - New documentary on Ernest Hemingway in northern Michigan to premiere in 2017. Ike: The Making of an American Hero - A public television special to be released in 2018 during the 75th anniversary of World War II. Navajo Code Talkers - Documentary on the untold stories of these World War II heroes "in their own words." Eisenhower's Secret War - Two 60-minute public TV specials on Ike's Cold War leadership, 1950-1960. Eisenhower Legacy Project - An ongoing series of television documentaries and related educational programming. Eisenhower Legacy Video Archive - More than 300 hours of interviews with Eisenhower Era witnesses and commentators. 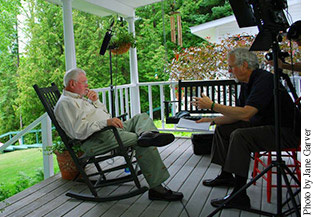 Ernie Mainland, nephew of Ernest Hemingway, talks with producer George Colburn on the porch at Windemere cottage, Walloon Lake, for the "Young Hemingway" documentary. 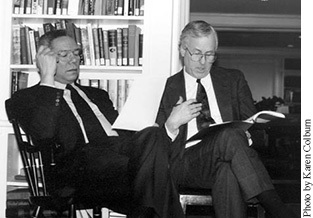 Writer-producer George Colburn works with host General Colin Powell on the script for "The Eisenhower Legacy" series. The 4-part series is now available from Starbright Media Corporation. 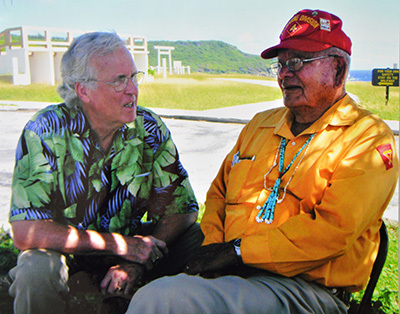 Producer George Colburn with the late Keith Little, president of the Navajo Code Talker Association, on the island of Saipan, in 2005, during taping of interviews for "Navajo Code Talkers: In Their Own Words." � 2013 Starbright Media Corp.